The Skinny: Probably entertaining for kids, but only occasionally diverting and possibly embarrassing for adults. Ninja Hattori-Kun is short on action and long on cheesy emotions. The whole package can amuse, but don't knock yourself out unless you've been dying for a combination of E.T. and Naruto. 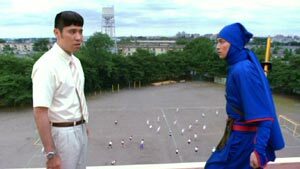 The saga of Ninja Hattori-kun, a diminutive blue-clad ninja who coined the ultra-cute catchphrase "Nin nin! 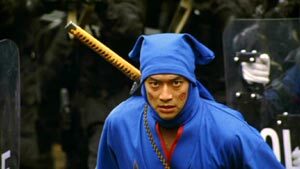 ", is given the live-action treatment in Nin x Nin: Ninja Hattori-kun The Movie. Shingo Katori of popular Japanese band SMAP stars as Hattori-kun, who's given the mandate to head to Edo to ascertain the activities of the rival ninja clan. The problem: Edo is now Tokyo, and the fast-paced modern world is about to get a taste of the delightfully sillyand sometimes annoyingways of Hattori-kun. Kids should go gaga over the antics of a bright blue ninja in urban Tokyo. But will everyone else? Probably not, though that won't stop some people. Anyone who's surfed the Internet enough should know that "Ninjas are sweet!" Oddly, this mantra is enough to get people interested in Hattori, who's more dippy than dangerous, and given to silly overacting and just plain annoying antics. As soon as Hattori gets to Tokyo, he chooses his new lord: an outcast tyke by the name of Kenichi (Yuri Chinen). Hattori has one big rule: he can't be seen by anyone but his lord, and if he is, then he must return to the wilderness. After getting the kid to buy in, Hattori discovers the joy of rice with mayonnaise, and even gives Kenichi remedial ninja lessons. Presumably, Kenichi will use his new ninja skills to become coolerwhich he does. However, instead of shuriken tossing or killing a whole roomful of people at the drop of a spoon, Kenichi uses the art of misdirection, meaning he ditches his clothes in the bushes and runs around the playground in his tighty-whities. The strategy allows him to outwit his schoolmates and his new teacher Kenmaki (Gori), but the moment isn't given the irreverent South Park treatment. Nope, director Masayuki Suzuki gives Kenichi's underwear escapades loving slow-motion coverage and even slops on the syrup with an inspirational musical score. Yes, Kenichi does triumph over his teacher Kenmakiwhich is actually pretty cool because Kenmaki is a ninja too (he's actually Hattori's former rival)but seeing a kid run around the playground in his underwear isn't very inspirational. It's just disturbing. Yet this is the world of Masayuki Suzuki's Ninja Hattori-kun. Suzuki previously directed GTO: The Movie, which took a hilariously off-color anime and manga and turned it into a cheesy inspirational comedy-drama that was sometimes entertaining, sometimes embarrassing, and sometimes just plain bizarre. 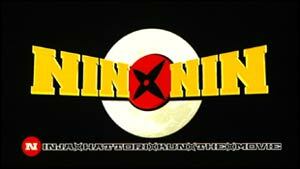 Nin x Nin is pretty much the same, mixing droll comedy and deadpan silliness with wannabe touching crap like Kenichi running around in his underwear. Also in the supposedly touching department: Kenichi and Hattori befriend blind girl Midori, whose character is only notable because she's played by Shiseido model Rena Tanaka. She's cool to hang out with because she can't see Hattori, and the three go on field trips and pal around in a benign, totally uninteresting manner. Shingo Katori mugs and overacts, and everything is as harmless as a dead animal. This movie isn't art, but it's not going to kill you either. Giving Nin x Nin the "move along" signal simply because it's harmless is probably being too nice, but I'll do it anyway. This is likely charming stuff for kids, who were the target audience for the original Ninja Hattori-kun, so it all works out in a same-demographic synergy sort of way. Even when peril does arrive (all sorts of ex-ninjas are being put into comas by a mystery assailant), everything gets handled without blood or any real sense of danger. Hattori must zip to the rescue, and Shingo Katori attempts to act serious with red swirls painted on his cheeks. He actually succeeds, but Katori's thespian prowess is ultimately neither here nor there. This is silly stuff for kids, so acting, story, plot, or direction are given much less weight. That's great because if I did apply my full critical authority (which was given to me by nobody in particular), then there could be only one word for Nin x Nin: crap.